Once a script has been created using the Code Editor, it can be executed in the development environment without moving it to the HomeSeer script directory. tenScripting provides the HomeSeer environment so that your scripts can access Devices, Events, etc. This allows you to take advantage of not only the capabilities of the Code Editor, but all of the functionality of the Microsoft debugging environment as well. You can place break-points in your script so that execution stops so that you can display the values of your variables as your script executes. In the sample below, a break-point has been placed at the Select statement. Execution stopped, and a list of variables and their values are displayed below the code. 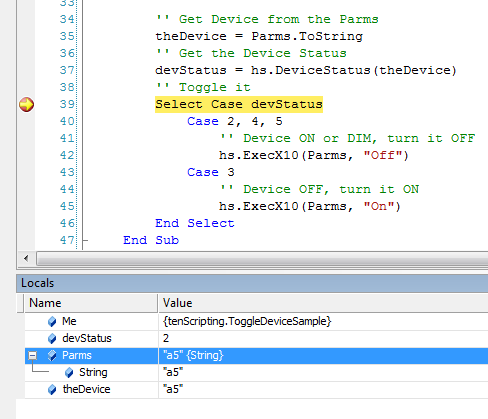 You can see how the Select/Case execution should proceed as devStatus is now equal to 2 for the device specified in the script parameters (theDevice is now a5). You can now single-step execution from the break-point and watch how your script actually executes. In the sample below, F10 was pressed twice to execute two steps further through the script. As expected, it branched through Case 2, 4, 5 to the statement that turns the device OFF. This sample also illustrates another way of displaying variable values. The mouse cursor was placed over the variable Parms, and the debugger displayed it's value. You can see how easy it is to create and develop HomeSeer scripts using the power of Microsoft's FREE development environment with tenScripting providing the HomeSeer environment.